Apple has released it’s iPhone X (10) – the new premium smartphone costing more than £999. The device showcases the latest technology, including an edge-to-edge OLED display, wireless charging and facial recognition security. Apple also revealed two other phones that upgrade its current range, the iPhone 8 and iPhone 8 Plus. So what do you need to know about Apple’s new flagship product. Apple are set to release two versions, a 64GB version, which will start at £999, and a more expensive 256GB version for £1,149 – the first smartphone to break the £1000 barrier. It won’t be available until later this year. The iPhone X will be available for pre-orders on October 27 and be released generally on November 3. What does the iPhone X look like? The iPhone X has a 5.8-inch screen squeezed into a body smaller than the iPhone 8 Plus. Apples goal has been to create “an iPhone that is all display”. They have dropped the iPhone’s iconic home button, which has been present on every device since the first iPhone released in 2007. It has also removed the front-facing fingerprint scanner, which has been adopted by plenty of other leading brands. Instead, the new iPhone X has a nearly bezel-free design with the screen covering almost the entire front of the phone. To make room for the front-facing selfie camera and facial recognition, the screen has a slight notch that indents at the top. It has a dual-lens rear facing camera and will come in the colours silver and space grey. Prehaps more controversial than a best feature, Apple has done away with the home button, which was used to control many aspects of the iPhone, including unlocking it with the embedded fingerprint scanner. Instead, the iPhone X uses gesture controls to unlock. Several functions of the home button, such as activating Siri, will be relocated to the lock switch. Users can control the phone through swiping up from the bottom or just by tapping the screen. Apple’s TrueDepth camera system lets users to unlock their phone by simply looking at it. Facial recognition technology replaces Touch ID as a way to identify users through an infrared camera. Face ID will only unlock if a users eyes are open. Apple said there is a “one in a million” chance that someone else could unlock the iPhone using the technology. Face ID will also work with Apple Pay, and other apps that work with Touch ID. The iPhone X is the first iPhone to come with wireless charging, which is already available on the Apple Watch and Samsung Galaxy S8. Apple will also release a wireless charging pad next year , called the AirPower, that will be able to charge multiple devices at once. Apple have long made it his goal to create an iPhone that looked like a single sheet of glass. The iPhone X has realised this design, with a 5.8-inch edge-to-edge display that covers the entire front of the phone, save for a tiny notch at the top. It will have a 2438×1125 resolution display with 458 pixels per inch and an OLED display. The iPhone X has been used to showcase some of the augmented reality experiences that Apple debuted with its ARKit software, released at this year’s WWDC. Augmented reality allows iPhone users to superimpose virtual images, games and videos onto real world objects and is a field where Apple has truly taken the initiative from rivals such as Google. The X can also use 3D tracking capabilities from its selfie camera to impose masks using AR for apps such as Snapchat. Animoji are a new form of moving emoji that can be customised using facial recognition software. Users can scan their face and the animoji will match their expression in a short animation. The feature will only be available on the premium iPhone X, as it requires the 3D camera. Apple has created a limited selection of animoji from its hundreds of emoji, including the monkey, unicorn, robot, dog, pig, cat, dog and pile of poo. The iPhone X will be an A11 bionic chip, a more powerful chip than the one found on the iPhone 8 and iPhone 8 Plus. According to Apple , the iPhone X will also provide two more hours of battery life than the iPhone 7. The iPhone X will follow the iPhone 7 Plus and have a 12MP dual lens camera, but it will also be kitted out for augmented reality. The selfie camera will be 7MP and also be able to function for 3D tracking. What about the iPhone 8? Alongside the premium iPhone X, Apple also unveiled the iPhone 8 and iPhone 8 Plus. The iPhone 8 and iPhone 8 Plus are similar in appearance to the current iPhone 7 and 7 Plus. The smaller version has a 4.7-inch screen, while the larger phone has a 5.5-inch screen and a dual camera lens on the back. Apple says the processor, the A11 Bionic, is “the most powerful and smartest chip ever in a smartphone”. There will be glass on the front and the back of the device, “reinforced by a laser welded steel and copper”. It will be water and dust resistant sealed. Both models will have a HD retina display and feature a 12MP camera. What colours can i get it in? The iPhone 8 will be available in silver, space grey and a new blush gold colour. When do the iPhone 8’s go on sale? The iPhone 8 will go on sale on 22/09/17. You can pre-order the new device from 15 September. iOS 11 will be available to download from 19 September. The will cost £699 for the 64GB version, and the 8 Plus will start from £799 (64GB). 256GB versions will also be available. Like the iPhone X, the two iPhone 8’s will come with wireless charging capabilities. This means the phone can be charged by simply placing it on a power pad. It is the first time the technology has come to the iPhone range. The new iPhones will come with Apple’s new operating system iOS 11. iOS 11 includes hundreds of new features like a redesigned control centre, better multitasking, improvements to the camera, peer-to-peer Apple Pay and new safety features. The iPhone 8 Plus will have a 12MP dual-lens camera, similar to the one featured on the iPhone 7 Plus released last year. It features a larger and faster sensor, a new colour filter and deeper pixels. Apple claims the new camera delivers “the highest quality video capture ever in a smartphone” with better video stabilisation and 4K video up to 60fps. While the demise of the home button and Touch ID on the iPhone X has been in the news, the iPhone 8 will maintain the button and Touch ID. It won’t, however, have facial recognition. The official information can be found here : http://support.apple.com/kb/DL1521 , but the security reasons for updating are hard to find from DL1521. The article shows a list of five “improvements and bug fixes”, none of which is a compelling reason on its own to update now. To see the security issues – you need to visit http://support.apple.com/kb/HT5278, and if you have an iDevice, I strongly suggest you read it. (2) Cross-site scripting. When you visit site X, code pulled in from site Y could execute as though it had been served from site X. XSS (short for cross-site scripting) is always a cause for concern. Web browsers are supposed to enforce a “same-origin” policy. Content from site Y should only be able to see cookies set for site Y, and scripts served from site Y should only be able to connect back to site Y to exchange or request further data. If a script from site Y can view cookies set for site X, then a crook in control of site Y may be able to recover session authentication data (set by site X when you logged in), and thus to impersonate you online. (3) Remote code execution. A maliciously crafted web page might crash your browser in such a way that it ends up running program code secretly embedded in the page. Executable machine code served up in an untrusted web page should never be able to get near to the CPU without provoking one or more do-you-really-intend-to-do-this dialogs. This helps to protect you from installing malware by mistake. Any time a hacker gets hold of an exploitable remote code execution (RCE) vulnerability, they’re laughing. They can sneak malware onto your computer or mobile device without consent or warning. So in short update to iOS 5.1.1 as soon as you possibly can. Step 4 – Enter your Apple ID and password. If you have an iTunes Store account or have ordered from the Apple Online Store, you already have an Apple ID. If you don’t have an Apple ID, tap Create Free Apple ID and follow the onscreen instructions. If you’re already a MobileMe subscriber, enter your me.com or mac.com email address and password. Step 5 – Check if your account needs verifying . If your MobileMe account says “Not Verified,” check your email inbox for a message from Apple. Click Verify Now and sign in with your Apple ID. If you don’t see a verification email in your inbox, select your MobileMe account and tap Resend Verification Email. Step 6 – Return to the MobileMe screen and switch on Find My iPhone. When the Find My iPhone message appears, tap Allow. Step 7 – This is the cool bit ! Goto your PC or Mac , goto www.me.com and sign in with your Apple id. You will now see the location of your iPhone AND you can lock it , wipe it or simply send a message or play a sound on it.. VERY COOL. Free iPhone’s on Facebook…. Don’t be fooled. Users on Facebook are being swamped with messages claiming that they have received free iPhones. These messages invite others to participate in a scheme to receive a free iPhone as well. What users don’t realise is that the messages are being sent by a number of applications that request access to their profiles & walls. Well , don’t be fooled – this is what happens when you click the link…. Like any other application on Facebook , it requests permission to access your personal information and access to posting on your wall. You’re going to allow it for a free phone worth around £600 right? Once the application has been given the permission to access, it congratulates you and request you take a survey to complete your transaction. The survey directs you to a website that also earns money for the spammers/hackers on a commission basis. Are you ever going to see your shiny new iPhone4 ? Nope.. not a chance. All that will now happen is that your Facebook wall will fill up with messages telling everyone you have a free iPhone 4 and encouraging them to do likewise. 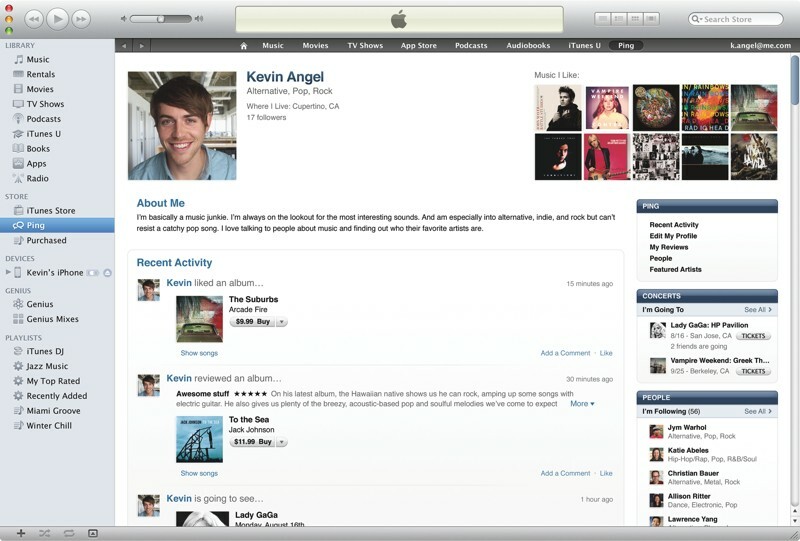 Apple has announced a new version of iTunes with ping ( Apple’s version of social networking ) , a new layout and a new logo. SAN FRANCISCO-September 1, 2010-Apple® today introduced iTunes® 10 with Ping, a new music-oriented social network for following your favorite artists and friends to discover what music they’re talking about, listening to and downloading. iTunes Ping lets you post your thoughts and opinions, your favorite albums and songs, the music you’ve downloaded from iTunes, plus view concert listings and tell your friends which concerts you plan to attend. iTunes 10 also features HD TV show rentals* for just 99 cents an episode and AirPlay wireless music playback. Ping lets you follow your favorite artists to see what they’re up to, check out photos and videos they’ve posted, see their tour dates and read comments about other artists and albums they’re listening to. You can also create a profile on iTunes to let your friends know who you’re following, what you’re listening to and which concerts you’re going to. There’s no better way to discover new music than to find out what your friends are listening to, and Ping’s Recent Activity feed shows you their posts about artists, albums, songs and concerts, plus a consolidated Top 10 list of the songs and albums your friends and the artists you follow are downloading from iTunes. In addition to using Ping on your desktop computer, you can take it with you on your iPhone® or iPod touch®,** so you’re always plugged into your personal music scene. With iTunes 10, you can rent your favorite HD TV shows commercial free from ABC, ABC Family, Fox, Disney Channel and BBC America and watch them at home or on the go for just 99 cents an episode. Thousands of episodes are available, many the day after broadcast, to watch on your Mac® or PC, iPhone, iPod touch and the all-new Apple TV®, and you have 30 days from the moment you rent an episode to start watching it, and 48 hours after that to finish it. iTunes 10 also features AirPlay wireless music playback to listen to your music on remote speakers using Apple’s AirPort Express® base station. In addition, AirPlay now works without AirPort Express, using speakers, receivers and stereo systems from companies including Bowers & Wilkins, JBL, Denon and iHome, so you can enjoy your entire iTunes music library wirelessly from any room in the house with no extra gear required. 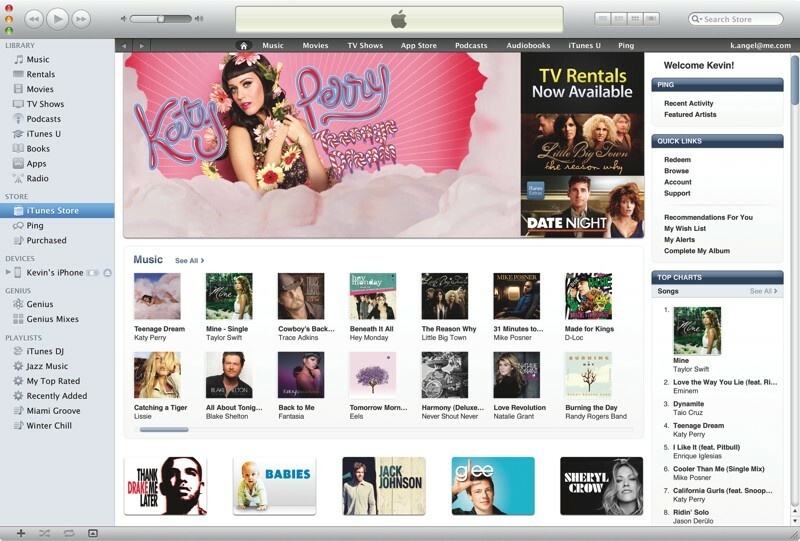 iTunes 10 is available immediately as a free download at www.itunes.com. The iTunes Store® has a catalog of over 14 million songs, over 65,000 TV episodes and over 10,000 movies including over 3,000 in stunning high definition video. 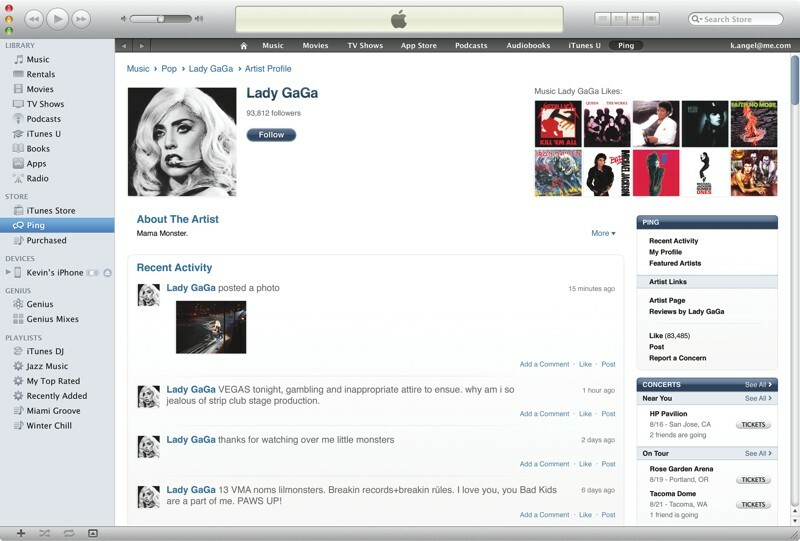 With Apple’s legendary ease of use, pioneering features such as iTunes Movie Rentals, integrated podcasting support, the ability to turn previously purchased tracks into complete albums at a reduced price, and seamless integration with iPod®, iPad™ and iPhone, the iTunes Store is the best way for Mac and PC users to legally discover, purchase and download music and video online. *HD TV show rentals require iOS 4.1, which is a free software update available via iTunes 10 or later for iPhone and iPod touch users. iOS 4.1 works with iPhone 3G, iPhone 3GS, iPhone 4, and second, third and fourth generation iPod touch. 99 cent HD TV rentals only available in the US. **Ping for iPhone and iPod touch requires iOS 4 or later, which is a free software update available via iTunes 9.2 or later for iPhone and iPod touch users. iOS 4 works with iPhone 3G, iPhone 3GS, iPhone 4, and second, third and fourth generation iPod touch. ***Tour info for Concert pages is provided by Live Nation Entertainment, a provider of live recordings to iTunes. How to create custom ringtones for iPhone 3G using iTunes for free? The following steps show how to create free ringtones for your iPhone using only iTunes and songs you already have on your computer. Note: This method only works with songs that are DRM free. To make iPhone ringtones using DRM protected songs please follow this guide to remove the DRM protection first. 1. Right click on the song you are going to make into a ringer and select “Get Info”. 2. Go to the “Options” tab and go down to the “Start Time” and “Stop Time” check boxes. Check both boxes and input the time you want your ringer to start/stop. The ringer has to be 30 seconds or less. Click “OK” when you’re done. 3. Right click on your newly “clipped” song and select “Convert Selection to AAC”. 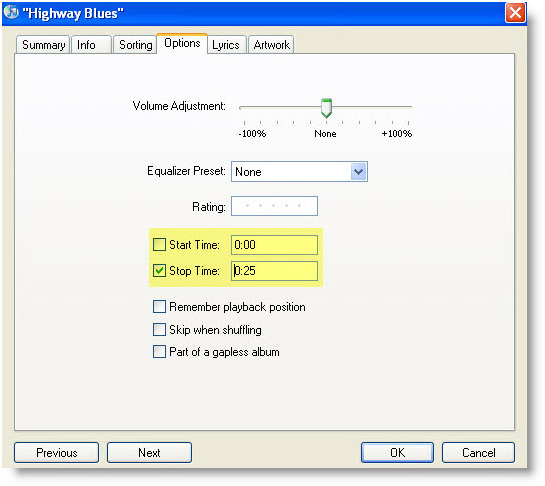 The song will be re-encoded using the start and stop times determined (If your menu item does not read “Convert Selection to AAC” and reads “Convert Slection to MP3” (or some other format) please go to iTunes -> Preferences -> Advanced -> Importing and change the “Import Using” drop down menu to “AAC Encoder”). 4. After the song is done encoding navigate to your iTunes Music folder, locate your song, and drag it to your desktop. After the song is on your desktop go back to iTunes and delete the clipped version from you iTunes library (It won’t delete it from your desktop, it will only remove it from iTunes). 5. Go back the song on your desktop and right click on your song and chose “Properties”. Go to the name and extension section and change the extension from .m4a to .m4r (or you can just change the extension right from your desktop). 6. After the extension is changed simply double click on the file to add it to your iTunes library under the ringtones section. Sync your phone with iTunes and you’re done! Note: Remember to go back into iTunes and uncheck your custom start and stop times for the original version of your song.